No matter if they are under shelter or not, exposed wood planks will weather over time and eventually need replacing. 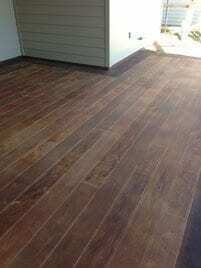 Exposure to moisture and UV light can degrade a wood floor quickly. There is an exception to this rule, though, and Keefe Duhon of New Iberia, Louisiana knows what it is. Concrete. That’s right, concrete with such an uncanny look of wood planks it is cause for a double take! Keefe and his Concrete Revolution crew have become quite adept at transforming plain concrete into “wood planks”. For this project they had a freshly poured outdoor concrete patio to work with. The concrete was prepped with SureCrete Design Products’ SCR. 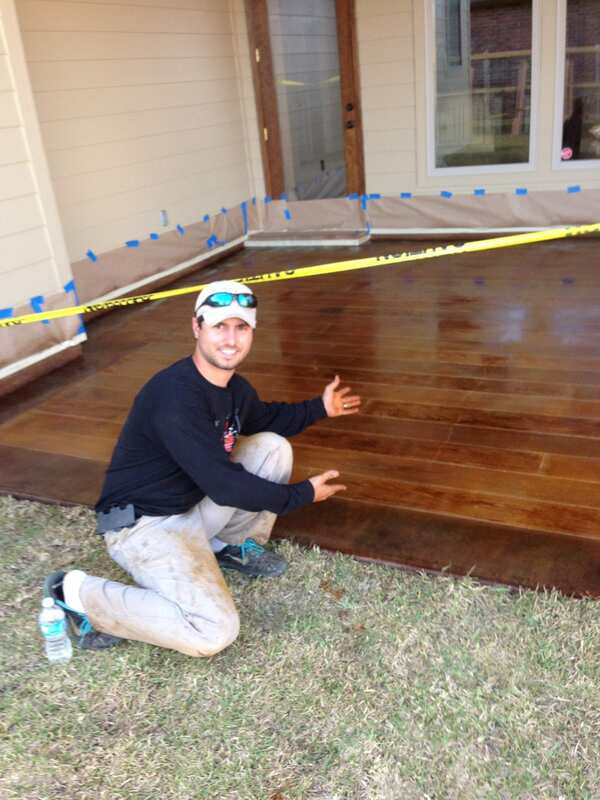 The patio was then scored and a base stain of a lighter shade walnut of Eco-Stain was hand brushed onto each plank. Keefe used a custom-made stencil for the wood grain. After strategically placing down the stencil, he sprayed, using a pre-valve, a darker shade (crimson) of Eco-Stain atop each plank. Details make all the difference and the stencil was just the beginning. For the finishing touch, nail holes were made with a Dremel tool then each was stained with a dark shade (espresso) of Eco-Stain. This stain was also used for the border. The “wood planks” were sealed with SureCrete’s HS-260; a premium clear solvent sealer ideal for weatherproofing concrete surfaces. Of course, using concrete to mimic the look of another type of flooring isn’t limited to only wood planking. Concrete overlays, stains and tools can be used in a near infinite number of combinations to create varying amounts of texture and vibrancy in your flooring surface to create looks you could never find in stores. Travertine tiles, Bamboo wood, Reclaimed Marine Wood, if you can think it up, concrete can help you create it without all the muss and fuss of the maintenance those types of flooring are generally associated with. So there it is, exposed wood that won’t weather…”wood planks” made of concrete!